Risk and vulnerability to climate change is socially differentiated and emerges from the intersection of different inequalities and uneven power structures. Vulnerability has been found to be typically higher among social groups who experience multiple deprivations that inhibit them from managing daily risks and shocks, including but not limited to women, children, the elderly, people with disabilities, ethnic minorities, and indigenous peoples. These groups face deeper climate impacts and significant barriers to coping with, and adapting to, such impacts. For instance, ethnic minorities typically face chronic poverty and lack legal status or citizenship that limits access to land, education, health and other public services. Research to date has revealed some of the impacts and particular vulnerabilities of children but there is a lack of scientific information on the intersectionality of girls’ and young women’s climate vulnerability, particularly in ethnic minority contexts. This report* seeks to help address this gap by adopting an intersectionality approach to better understand the different climate risks, vulnerabilities, adaptation and resilience among people of different ages and different genders. Specifically, this report aims to shed light on the specific climate change challenges faced by young women and girls in Northern Thailand whose experiences are not only influenced by age and gender, but also by poverty, legal status, ethnicity, language and education. The study was conducted in Chiang Rai and Chiang Mai provinces, in the rural, mountainous region of Northern Thailand, which is largely inhabited by indigenous people and ethnic minorities. People in these remote communities face high rates of poverty and rely heavily on subsistence agriculture to meet their livelihood and food consumption needs. 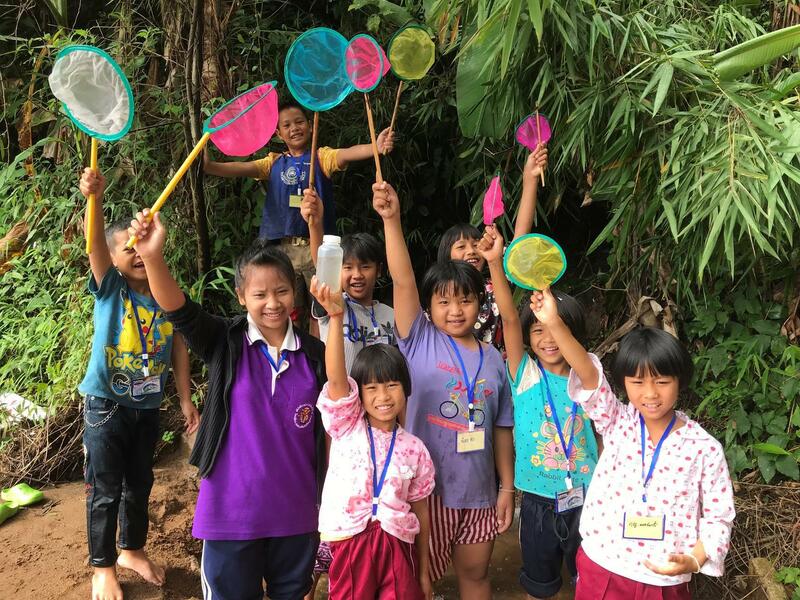 Data were collected through interviews and focus group discussions with young women, girls, boys, school teachers, and village climate change adaptation committees from Mae Fah Luang (Chiang Rai province), Fang and Mae Ai (Chiang Mai province). *An overview of key learning from the report is provided below. Download the full text from the right-hand column for much more detail. Respondents identified six major climate-related risks that they have experienced: drought/water scarcity, storm (including hailstorm), flood, landslide, and extreme temperatures. Experiences of coping with drought/water scarcity were found in all villages and schools. Climate-related risks were found to have serious consequences to women’s and girls’ daily lives in six main areas: water security, livelihoods, food and nutritional security, health, education and migration. The burden of water insecurity falls predominantly on women, who are largely responsible for sourcing water for household consumption and are sometimes required to travel to find alternative sources on a daily basis. One young woman interviewee said she has to walk to the village head’s house to fill up a 20-litre tank with water and then carry it home on her back alone three times a day. Alternative sources of water, such as from nearby rivers, are sought for bathing and household chores, but are often unsafe and can cause health problems for women and children. Girls are more likely than boys to support their mothers in sourcing water and assisting with household chores, and the time burden and associated risks increase during times of scarcity. At school, water consumption is also reduced during times of scarcity, which can have sanitation and hygiene impacts, girls facing additional sexual and reproductive health risks. During the rainy season, floods, storms and landslides can often block access roads, damage crops and kill livestock, reducing yields and revenue. Reduced or insufficient household income due to climate change increases the pressure on women and children to support in generating income, which doubles women’s responsibilities as they must also balance this with household labour responsibilities. Reduced farming incomes can also compromise children’s well-being as some children, especially girls, are required to support their family’s income by working on farms, particularly after school, during the weekend and school holidays. All of the climate-related risks identified by respondents, to some extent, damage crops grown in communities and schools. Reduced crop yields lead to higher market prices and reduced intake of nutritious foods (e.g. fruits and vegetables), making children and pregnant young women particularly vulnerable to hunger and malnutrition. Girls spoke of delayed mealtimes during droughts because of the lack of available water nearby. Young women and girls face unique climate-related health risks, including sanitation and hygiene problems resulting from air and water pollution, a lack of clean and safe drinking and bathing water, and a lack of nutritious foods. Risks are particularly acute during the dry season and times of water scarcity. Climate-related risks impact girls’ and boys‘ access to education by damaging buildings and infrastructure, blocking roads and affecting food and water availability in schools. Girls’ education is particularly impacted by absenteeism and drop- outs linked to supporting parents at home and at work, and to increasing rates of migration. Ethnic minority children without Thai citizenship status do not have the same access to education as Thai citizens. Economic migration is being driven by declining incomes from agriculture, partly associated with recent periods of water scarcity and impacts on crop yields and revenues. Migration can increase the climate vulnerability of girls in particular in terms of disruption to education, emotional distress, lack of support networks, and increase in household and caregiving responsibilities. Young women are also increasingly looking for work opportunities outside of their communities; some are finding work in factories, restaurants and as domestic workers, and have to balance childcare and work. For further reading you can find the report here or download it from the right-hand side of this article. This research is a partnership between Plan International, Stockholm Environment Institute (SEI) and the Sustainable Mekong Research Network (SUMERNET). This project is part of the International Climate Initiative (IKI). The initiative is funded by the Federal Ministry for the Environment, Nature Conservation and Nuclear Safety (BMU) based on a decision of the German Bundestag.